Second temporary home of St. Michael’s Mission was the Mr. & Mrs. Frank Cunard Sr. residence, 13461 Downey Ave, Downey, California. Services were held here June 5, 1977 through July 3, 1977. We also enjoyed a potluck dinner here during June. Click to see more posts tagged with photos. First temporary home of St. Michael’s Mission was a building formerly St. Michael’s Monastery, 6567 Fry Street, Bell Gardens, California. St. Michael’s Mission held services here starting Easter Sunday (April 10, 1977) through May 29, 1977. Literally translated, “orthodox” means both “right belief” and “right worship”, standing in opposition to heresy or heretical belief. The Orthodox Church is neither “Protestant” nor “Roman Catholic”. It traces its historical and spiritual roots in unbroken succession directly from the descent of the Holy Spirit upon the Apostles on the first day of Pentecost through today. As the Apostles set out to bring the Good News of Jesus Christ to the world, they established churches throughout the Middle East, Europe, Asia, Africa, and beyond. Over time, the bishops of five major cities, Jerusalem, Antioch, Alexandria, Rome, and later, Constantinople, became autonomous, co-equal, spiritual and jurisdictional leaders, or patriarchs, of the one, undivided Holy Catholic and Apostolic Orthodox Christian Church; as patriarchs, they oversaw bishops, clergy, and laity in their respective jurisdictions. Even the murderous persecutions mounted by the Roman Empire were unable to suppress the Church, and it came fully into its own after being legalized in 312 AD by the Roman Emperor, Constantine the Great. This freed the Church to deal with critical theological issues in the seven Great and Ecumenical Councils held over the ensuing decades and centuries. During this period, the Church determined which of many books and letters attributed to the Apostles and disciples were genuinely inspired by the Holy Spirit to constitute what was to become, in 382 AD, the canon of the New Testament. It clarified the meaning and nature of the Holy Trinity as God the Father, God the Son, and God the Holy Spirit. It defended the dual nature of Jesus Christ as fully God and fully man against the attacks of heretics, and it defined key elements of Christian Faith in the Nicene Creed. Orthodox Christianity, from the very beginning saw both Holy Scripture and Holy Tradition as complementary to one another. As the Apostle Paul wrote: “Therefore, brethren, stand fast, and hold the traditions which ye have been taught, whether by word or our epistle” (II Thes. 2:15). Likewise, Orthodoxy remains on guard to the Apostle’s admonishment: “Beware lest any man spoil you through philosophy and vain deceit, after the tradition of men, after the rudiments of the world, and not after Christ” (Col. 2:8). Thus, while Orthodoxy is a Bible believing and Bible based church, its belief and interpretation of the Bible is not left to individual opinion but is tempered by the wisdom of Holy Tradition, the Church Fathers, and the Church Councils. Orthodoxy accepts, among others, the seven main sacraments of the Church: Baptism, Chrismation (confirmation), the Eucharist (Holy Communion), Penance (repentance and confession), Holy Unction, Holy Orders, and Holy Matrimony. Orthodox life emphasizes the love and joy of the Good News of Jesus Christ, the reunion of a fallen humanity with its God, and the victory of the Resurrection. The Orthodox Church views salvation less as occurring at one specific “born again” instant and more as a continuous process of “being born again”. From its earliest days, the Church recognized that even mature Christians fail; perfect living is a worthy goal, but it is beyond human achievement. Orthodoxy therefore sees salvation as a gift from God as we turn our hearts to Him; it is a process of nurturing spiritual growth and renewal through time; it comes as the fruits of love, repentance, prayer, worship, and service in Christ’s Holy Church. Orthodoxy sees the Church as the organic, living Body of Christ, who is its only Head on earth and in Heaven. As the Body of Christ, the repository of Faith, the community of the Faithful, and the dispenser of Sacraments, the Church is essential for the salvation of its members, and its members are essential for the salvific work of the Church. In conformity with the first century Church, Orthodox worship focuses on celebrating the Eucharistic Mystery of the Body and Blood of Christ’s Sacrifice with hymns, Psalms, prayers, and teaching. The Divine Liturgy remains the forms and prayers of the early Church, having changed little in the last fifteen centuries. We welcome your interest in Orthodox Christianity, and we will be pleased to answer any questions you have. 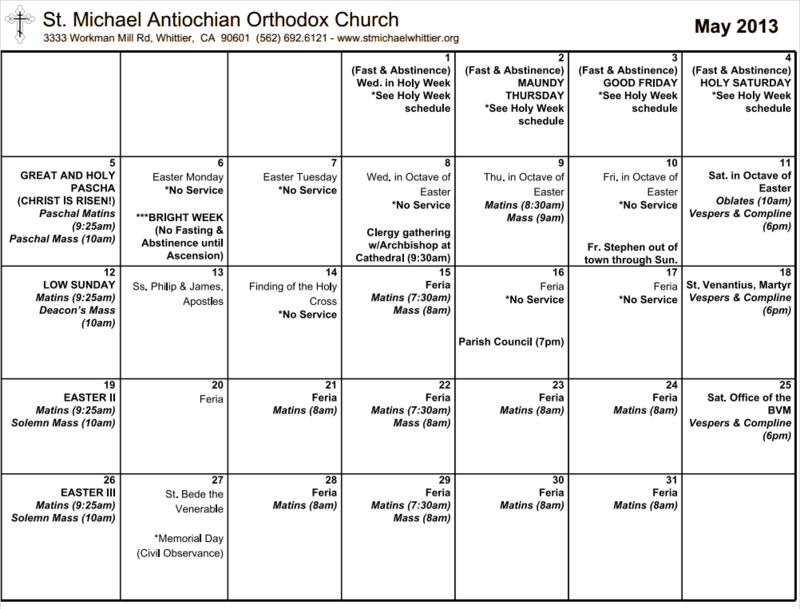 Please check our service schedule if you plan to visit. Fr. Michael Trigg was born Elwood Bellew Trigg on March 23, 1940 to Earle Bellew Trigg, MD and Emily Daley Trigg, RN of Inglewood, California. He had one sibling, his older brother, Earle, who died in middle age. Deeply religious from his youth, Fr. Michael showed a passion for reading, research and scholarly pursuits, especially in the fields of science, religion, and anthropology. He graduated from UCLA with a Bachelor of Arts in 1961 and from USC with a Master of Arts in 1964. He completed the normal two-year course of seminary training at the College of the Resurrection, Mirfield, Yorkshire, England, before graduating with a Doctor of Philosophy degree from Oxford University in 1968. After such intense studies, his parents gave him a year simply to stay in London and enjoy life. His formal ecclesiastical life began with ordination as Deacon in 1970 and Priest in 1971 in the Episcopal Diocese of Los Angeles. He served as Assistant first at St. Alban, Westwood, and then at St. Mary of the Angels, Hollywood. 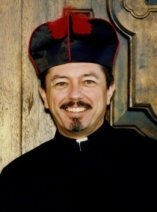 In 1977, he joined the Anglican Catholic Church, and, in 1978, founded St. Michael Anglican Catholic Church, Downey. He brought St. Michael Church as a Western-Rite parish into the Antiochian Orthodox Christian Archdiocese of North America in 1980. Now in its seventh home, the St. Michael Orthodox Church we know today was consecrated by Metropolitan PHILIP in Whittier, California, on September 9, 1990, as the result of the hard work an sacrifice of many devoted people. Fr. Michael paid attention to every detail of the facilities, especially the aesthetics and acoustics. He gave icons, vestments, and chalices for the church, and together with his father gave the organ in memory of his mother. Along with others, he acquired the very fine Stations of the Cross that adorn the walls of the Nave. More recently, he gave the patio fountain and statue of St. Michael in memory of his parents. Fr. Michael was among those making sacrifices, as he did not draw a normal priest’s salary during his ecclesiastical career. He depended upon secular work for his livelihood. In addition to owning a small real estate investment company, he served for eight years at California State University, Los Angeles, where he rose to be Associate Dean of Student Affairs, and nine years at Biola University, where he served as Dean of Student Affairs until his retirement in 2002. He was able to travel extensively to Europe, the Middle East, North Africa, South America, and the Orient. He also authored the book Gypsy Demons and Divinities, described as the “Opus Magnum” on the subject of Romany magical and religious beliefs, a subject related to his doctoral studies at Oxford University. The focus of Fr. Michael’s life, however, remained service to Our Lord and His Church. A humble man, he truly loved serving others. His greatest joys were in gathering sheep to Our Lord’s flock, administering the Sacraments, developing new clergy, and serving as a spiritual father to so many, always in accordance with the highest standards and finest traditions of the Church. Metropolitan PHILIP recognized this service when he elevated Fr. Michael to the dignity of Archimandrite on August 15, 1993. Even as Parkinson’s disease ravaged his body in his later years, Fr. Michael continued to served his flock with gentle strength and grace until he peacefully fell asleep in the Lord on May 12, 2007, a week after having been named Pastor Emeritus by Bishop JOSEPH. Those whose lives he touched will sorely miss him.